Q: How long is your trial period? Q: Can I end my trial early and start my plan now? Q: How can I change my plan? Q: I've been charged/billed incorrectly. What can I do? Q: What payment methods do you accept? Is your billing system secure? Q: Can I cancel at any time? How to cancel your subscription. Q: How do I change a legacy plan? Q: What is the best plan for me? We have quite a few options so it really does depend on your business needs. The "Basic" is an entry level package that will enable you to get started on the AMZ Tracker and the Amazon Review Club. For people who only have one product, this is the perfect solution. The "Professional" plan is our most popular plan, this plan is for sellers who have more than 1 product and are ready to that their Amazon selling to the next level. For experienced sellers with multiple products or seller accounts, the "God Mode" or "Corporate 1" plans give you a massive edge of the competition with higher limits across all features with the "Corporate 1"
Note: You can always downgrade or upgrade your plan at any time if you feel the need to. Q: What are the limits on your plans? A: We offer a free 7 day trial for you to use AMZ Tracker, and test out it's features. There is a limit on promotions you can run on your run on your trial period. On all plans for the trial plan you will have a limit of 5 code sends. However you can end you trial early and start your plan immediately to get more codes. See " Q: Can I end my trial early and start my plan now?" for more information. For plans on the Basic package and above you will have access to our awesome Amazon Review Club. A: Yes, if it takes less than 7 days for you to see the awesome power and value in an AMZ Tracker plan then you can end your trial early and start your plan immediately with full access to all the plan features. 1. Press the button indicated with the arrow below "End Trial, Start Full Paid Plan"2. You will be taken to a screen to confirm you are ending your trial and upgrading your plan. You will now have ended your trial early, started your selected plan with AMZ Tracker and now have full access to all the awesome features to boost your Amazon sales. You can change the plan level of your account at any time. Note: If you are downgrading, you will still have access to your current plan, your new plan downgrade will occur at the end of your billing period. Upgrades to do change your billing cycle either. You will simply have access to the upgraded plan for the remainder of your current billing cycle. 1. Go to the 'Account Settings' tab on the left menu. 3. Choose the 'New Plan' you want from the drop down. 4. Click the 'Change to this Plan' button. 5. You will be taken to a screen to confirm you are ending your trial and upgrading your plan. 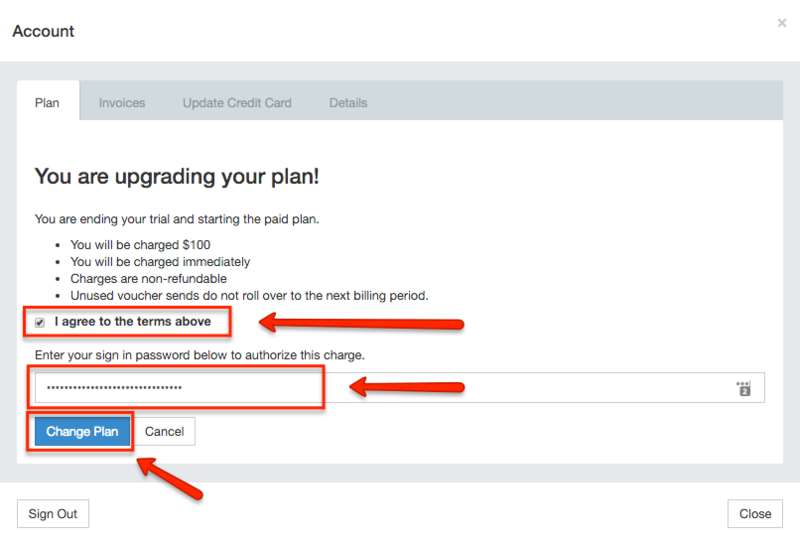 After pressing the "Change Plan" button you will be charged immediately and will have access to your plan upgrade. Note: If you are downgrading, you will still have access to your current plan, your new plan downgrade will occur at the end of your billing period. We may ask for your last four digits of your card in cases where we need to verify your account. But please note we would never ask for your full card details, the expiry or any other type of card information. Just these last 4 digits. A: Your invoices can be found in the Account Settings > Invoices tab. And just so you know we don't have any tax or VAT associated with our company. A: All credit and debit card info is handled by Stripe who is our payment processor. Our website is https secure, and all card numbers are on a disk within Stripe with AES-256 encryption. U.S. businesses can accept Visa, MasterCard, American Express, and Diners Club. We do not support any other payment methods such as PayPal, direct deposit, or cheques. A: Our plans are a monthly subscription with NO commitment. Just a monthly price, and you can cancel at any time. Q: How do I change my legacy plan? Firstly, thanks for your support, you've obviously been with AMZ Tracker for a while and we really appreciate that. Note: We are no longer offering the legacy plans so if you decide to cancel and then come back to AMZ Tracker later, you may be unable to select the same plan limits and price and will need to select from the available plans at the time.